Though there are many variations when it is coming to chicken, very few recipes we make it very frequently and they never fade from our taste buds. 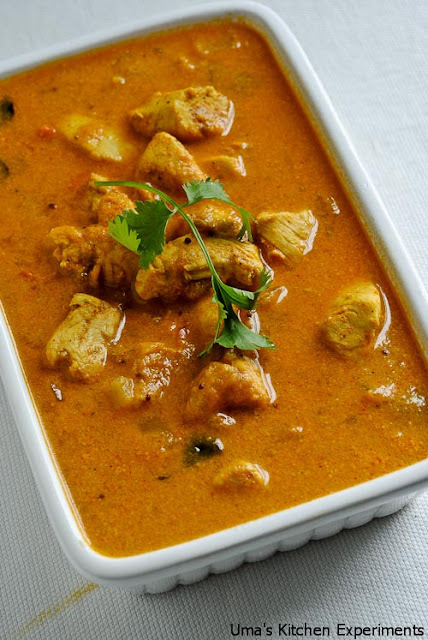 This chicken in coconut gravy is one such recipe almost every south Indian prepares it at home. With the very simple ingredients, we can prepare a tasty chicken gravy. 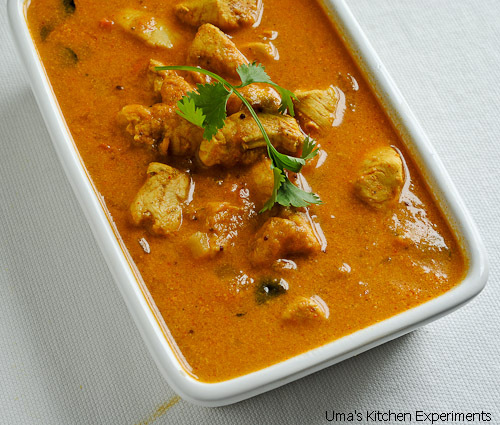 This recipe is perfect when you need to prepare a quick chicken dish. 1) In a bowl, add chicken pieces, salt, pepper and turmeric powder and mix well. Keep aside for 10-15 minutes. After 10 minutes, half cook the chicken and keep aside. 2) Grind grated coconut with cumin seeds into a paste by adding water and keep aside. 3) In a pan, heat oil and when it is hot, add mustard seeds and urid dal. 4) When they splutter, add curry leaves followed by ginger and garlic paste with minced green chilli..
5) Saute for a minute and add onions. Continue sauteing until they become translucent. 6) Add chopped tomato and saute till they cook well. 7) Add half cooked chicken pieces, red chilli powder, coriander powder and salt. Remember you have already added little salt to chicken pieces. 8) Add required water and cook till the chicken become soft and tender. 9) When the gravy starts to thick, add coconut paste and cook for few minutes. After few minutes, the oil oozes out from gravy. 10) Remove from heat and garnish with coriander leaves. 11) Serve hot with steamed rice. Goes well with chapthi too. i must have a lot of rice to go with this dish, look so delicious! Love this anytime. Nice flavorful dish. 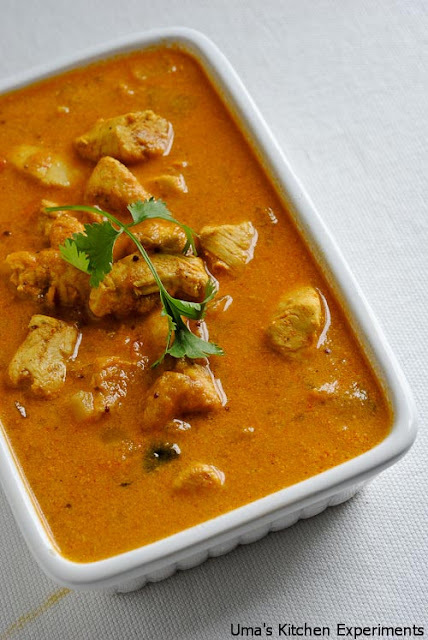 Fabulous chicken curry...so tempting and mouthwatering..
lovely colour n tempting gravy!! Everyone has only commented on the looks of this tempting dish.....but has anyone, actually taken the effort to make it, taste it and then comment....??? I did....and it actually came out very yummy...but the only thing is that those who dont hav any idea about approximately how much water to add....they will end up with a watery chicken.....so I think the exact quantity of water is required, Uma.....otherwise its a perfect chicken....thnx. @Muskan Hingorani, Thanks a lot for trying it out and giving me the feedback. You can add 3/4 cup of water to the gravy first and if you feel it is too thick, add 1/4 cup next. Always start with smaller quantity.